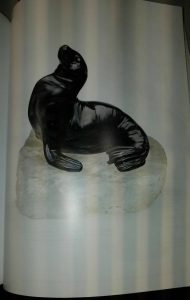 How to Ship Antique Faberge Masterpieces? Several weeks ago, our New York team visited London to officially open a new representative office located in the Heathrow Airport area. 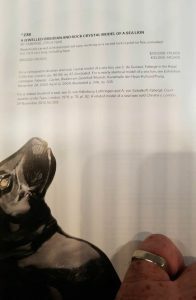 This trip was especially exciting because we had a chance to visit several important sales during Russian Art Week, including Christie’s Russian Art Auction that featured a truly unique selection of Russian art masterpieces, icons, and Faberge. 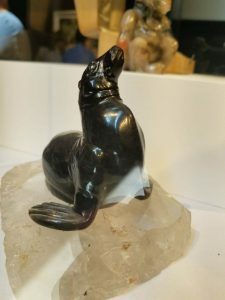 Since Fine Art Shippers specializes in shipping fine art and antiques, it was also a perfect opportunity for our team to inspect many unique and rare works of art, such as this beautiful jeweled obsidian and rock crystal model of a sea lion, created by Faberge circa 1900. It goes without saying that to ship antique pieces like that is not only an honor for any art moving company but also a big responsibility as such items require special handling. The House of Faberge was founded by Gustav Faberge in St. Petersburg in 1842. This famous jewelry firm became world known thanks to Peter Carl Faberge, the son of Gustav Faberge, who designed the first Imperial Easter eggs for Tsar Alexander III and his wife, the Empress Maria Fedorovna. For today, these eggs decorated with precious stones are sold for millions of dollars at auctions worldwide. 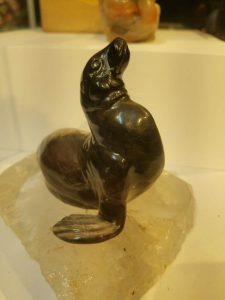 However, the House of Faberge was also known for producing other exceptional jewelry pieces like this realistically carved model of a sea lion with diamond-set eyes. Its estimated price is $120,000 – 170,000. Taking into account all of the above, it becomes clear why to ship antique Faberge pieces is a very responsible task that should be entrusted to only professional art shippers with years of experience in handling and moving fine art. 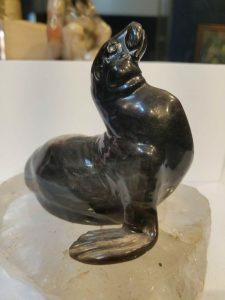 Fine Art Shippers is just a perfect choice for this job as our team knows exactly how to ship antique pieces like this amazing Faberge sea lion safely and securely. 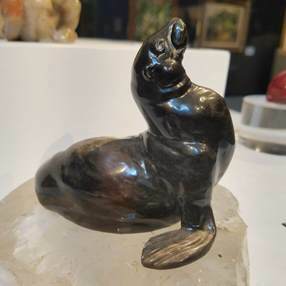 It is also impossible not to mention that this Faberge sea lion is reminiscent of the latest Banksy mural depicting a seal with a ball, which was discovered in Brooklyn, NYC this March. While these works of art are very different, both of them are very valuable, and both require special handling. 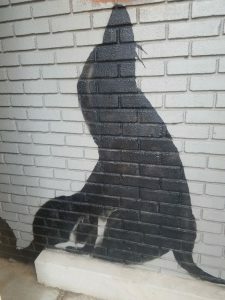 At Fine Art Shippers, we can ship antique Faberge masterpieces of any kind, and we can ship Banksy walls of any size and weight. Thereby, whatever art shipping help you need, please feel free to contact our team! Moreover, all our services are very reasonably priced. You can easily verify this by requesting a shipping quote right from this website!